One of the great Fiestas across Spain is the Moors & Christians Festival which come in all shapes and sizes. The grandest ones being in the major Valencian cities & towns. They are well worth making a journey for. One of the most spectacular near to the Hondon Valley takes place in Abanilla (Murcia region) where colour and ornate costumes are the order of the day as the festival of Santa Cruz gets underway. This year the “May bank holiday” is a week of celebrations in Abanilla with the main event being the parades of Moors and Christians. Moros y Christianos [Wikipedia] – is a set of festival activities which are celebrated in many towns and cities of Spain, mainly in the southern Valencian Community; according to popular tradition the festivals commemorate the battles, combats and fights between Moors (or Muslims) and Christians during the period known as Reconquista (from the 8th century through the 15th century). 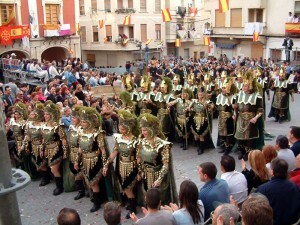 The Abanilla festival features parades of armies of Moors and Christians. The armies are made up of societies (28 of them in 2009 !!! ) of local people, dressed in ornate outfits. Each society wears a unique costume and carries banners and each selects a queen every year to represent it. On Monday 3rd May the main event is a pilgrimage to the Mahoya Chapel, where the town’s people carry a cross in procession. There is usually stalls, music and other entertainment laid on – the Spanish love the festival and you’ll be sure to see some amazing costumes – they put a lot of effort into their fun !! Abanilla is about 20/25 minutes from Hondon and a nice drive throught the Hondon Valley into Murcia. If you can’t make Abanilla there are sure to be other Moors and Christians festivals taking place in Valencia province throughout the spring and summer.